A few weeks ago one of the Family Holiday Association trustees, David Burling, told me about a school in a poorer part of London that he knew about. He thought that it would be worthwhile reading “Oranges & Lemons; Life in an inner city primary school” a book that had the experiences of Edith Neville Primary School pupils and staff as its subject. The book, written a few years ago by an award-winning journalist Wendy Wallace, describes the highs and lows of life in a school serving a poor inner-city community in the London borough of Camden. Wallace provides a really moving account of the struggle, against the odds, to help provide children, many from difficult backgrounds and some with serious personal issues, with a good early education. There is one particularly striking passage in the book that tells a story that I recognised as hearing time and time again from teachers across Britain; it describes the incredible value of something very simple – a day out at the seaside. “…staff at Edith Neville make great efforts to give children experiences beyond the school gates. On the annual visit to Broadstairs on the Kent Coast, there are always a handful of children and adults who have not seen the sea before. On outings in London, some are unfamiliar with escalators, ticket barriers. London Zoo, within easy walking distance of Somers Town, is a foreign land for most families when they first go with the school. 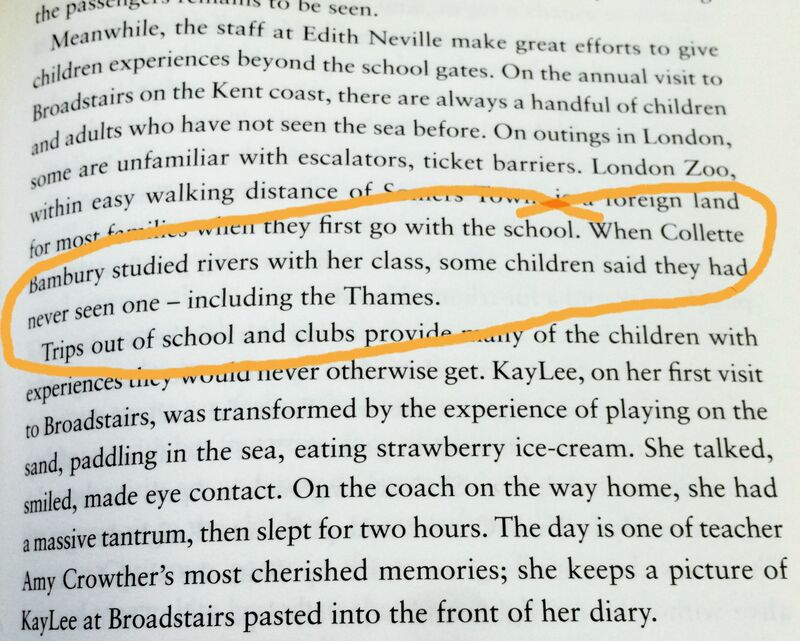 When Collette Bambury studied rivers with her class, some children said they had never seen one – including the Thames. One line in that passage that particularly struck home was that some children, despite living in central London, had never seen the Thames. This reminded me of a visit I made to a Hackney primary school when the same story was told; children whose horizons where so restricted as result of rarely venturing beyond their estates that they too had never seen one of the world’s most famous rivers. Despite being less than two miles from the school, within easy walking distance or, for children at least, a simple free bus ride away, one of London’s great attractions was beyond their reach. If seeing the Thames was an experience denied to these children then it doesn’t take too much imagination to begin to appreciate just what other opportunities they might be excluded from. The Family Holiday Association works in partnership with a small number of schools across the UK in order to demonstrate that by expanding the horizons of pupils and parents this helps the family, the family/school relationship and, in turn, the whole school community. The head teachers with whom we work already understand the impact even a simple break can deliver; from a happier child, a stronger relationship with parents, improved attendance to reduced low-level classroom disruption. Holidays really do matter; especially for the child that has never seen the sea or ventured further than a couple of miles from the end of their street.